Cycling is a sport that countless numbers enjoy regardless of age. In addition to providing the chance to enjoy the outdoors, the activity also serves as a low-impact form of getting vital cardiovascular exercise. The vast models of bikes ensure the perfect fit for everyone. The popularity of cycling now means more options to engage in the activity whether living in the city or more rural environments. Whether an amateur or having on-the-road experience, there are many ways to improve comfort, performance and safety while riding. Protect your head from injury! Statistics indicate that more than 6,000 cyclists require emergency medical care every year secondary to suffering a head injury. Head trauma is blamed for causing 75 percent of cycling fatalities. When chosen and worn properly, cycling helmets prove up to 90 percent effective in preventing brain and head injuries. Select a helmet that meets product safety standards. Approved helmets often don a sticker. Opt for a bright color that increases visibility. Ensure that the helmet fits snugly. When buying a bike, make sure that the frame is appropriate for your body size. Stand in a straddled position over the bike. There should be at least two inches of clearance between the groin area and the top of the cross tube. Handlebars should be adjusted so that they are approximately one inch lower than the top of the seat. Consider making the purchase at a reputable bike shop, or take someone with you who has cycling experience to ensure a proper fit. Find a seat that suit you and make you feel comfort while cycling! Racing bikes are notorious for having narrow, hard seats that are particularly uncomfortable for most women. 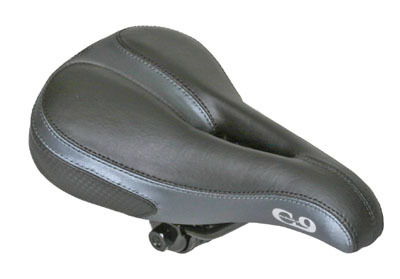 Female riders often find that anatomically designed seats provide wider support and have more cushioning. Seats having gel fillings or sheepskin coverings help prevent friction while easing the pressure of body weight. The height of the seat is equally important. The seat should be adjusted so that knees bend only slightly when the pedal is at the lowest point of the rotation. Also make sure that the seat is level for the best comfort. Get clothing that make you comfort and protect you! Most who cycle regularly prefer riding in shorts. The general lack of material means that there is a less likelihood for bunching or wrinkling of fabric. Cycling shorts additionally have no seams to cause irritation and feature a lining that wicks perspiration away from the body. Especially if riding long distances, and the bike is not equipped with clips on the pedals, consider wearing cycling shoes. Each shoe has a fitted cleat that locks onto the pedal and holds the foot in place. Whether having a sedentary lifestyle or just starting out cycling, resist the urge to overindulge. Find a location with flat terrain and keep an initial outing to around 30 minutes. Ride a few times a week and keep this pace for the first two or three weeks until the body adjusts. Gradually increase riding times and incorporate more challenging surfaces that might include hills. Encourage others to join your efforts or ride with an established group. After making the ride up a hill, many are tempted to merely coast down the other side. However, the work performed by leg muscles commonly creates lactic acid, which causes the familiar burning sensation. Instead, when descending, keep legs moving by pedaling. Even with little resistance, this action prevents acid build-up. Staying in the same position for extended lengths of time stresses muscles and nerves, which may lead to cramping in the hands, neck and shoulders. Change body and hand positions frequently while riding. Relax your arms and never lock the elbows. ← How is a Business Twinning Programme Useful for You?